Open Office XML (also known as OOXML or OpenXML) is a XML based file format developed by Microsoft for representing office documents. An OOXML file is stored in zipped, XML files. andxmls depending on sheets . We are going to talk about drawings and the chart parts in this blog. To insert any type of drawing objects in office documents DrawingsPart is base part in which we append child elements. // Add a new drawing to the worksheet. FromMarker is used to specify from position of chart using From excel column and From excel row. ToMarker is used to specify position of chart using To excel column and To excel row. // Position the chart on the worksheet using a TwoCellAnchor object. // Append a GraphicFrame to the TwoCellAnchor object. // Save the WorksheetDrawing object. // Add a new chart and set the chart language to English-US. Chart plot area is main chart object which is used to create objects like Layout, BarChart, Chart axes. 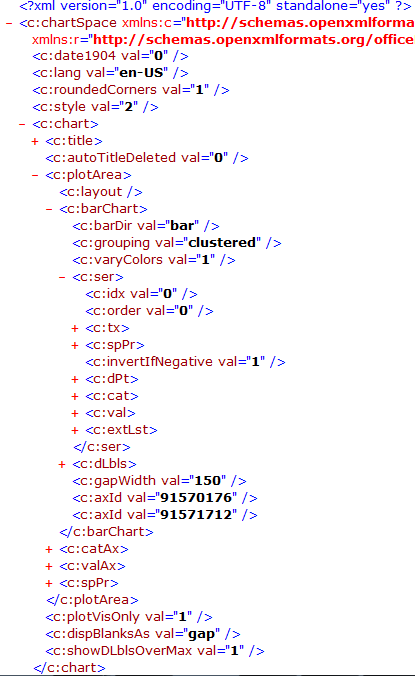 Color of each bar can be changed using the above code. 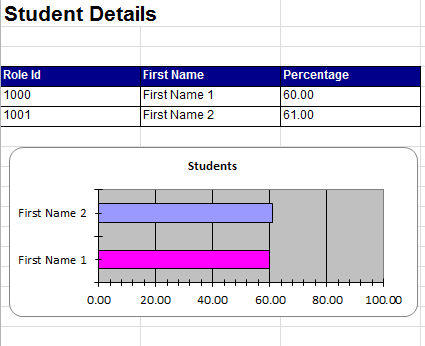 Index objectofdata pointis referred for each bar in bar chart starting from 0. Here data is input data and its object type isDictionary. Category axis is used to specify values like axis id, scaling, axis position, crossing axis and so on. Value axis is same as Category axis, it is used to specify values like axis id, scaling, axis position, crossing axis and so on. // Add the Value Axis. Click here to download Final code of inserting bar charts in Excel using OOXML and C#.